As recently reported by CNN Money, the US has reached its annual quota of EB-5 immigrant investor visas, and has warned there will be no more spaces left for Chinese applicants after May 1, 2015. 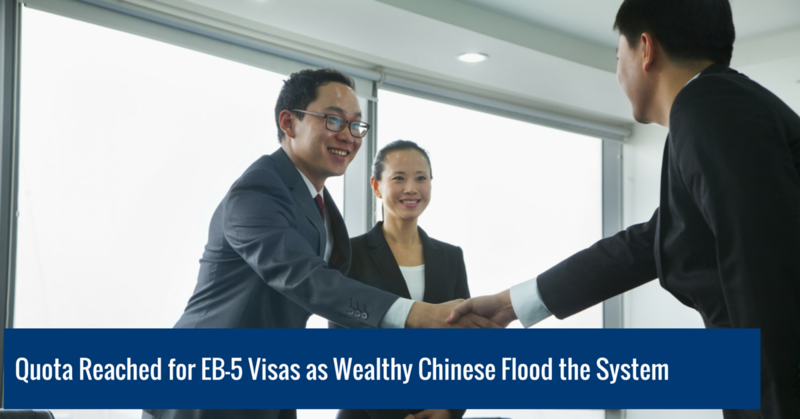 It’s the second year in a row the annual supply of EB-5 immigrant investor visas, which provide green cards to immigrants who can invest at least $500,000 and create 10 American jobs, have been quickly snapped up by wealthy Chinese investors. As recently announced by the State Department, there will be no more spots available for Chinese investors until the end of the United States government’s fiscal year. The EB-5 investor program caps the annual quota of visas issued at 10,000, and first hit its limit in August 2014. However, it seems that demand in 2015 is even higher, with the program reaching its quota much earlier this year, particularly due to the amount of rich Chinese investors who are willing to invest, and the fact that Canada ended a very similar program last year. Well, it now looks like the waiting time for an EB-5 visa could be anything from two to three years. Currently there are around 13,000 pending applications, and many applicants are particularly worried about whether or not they will be allowed to secure green cards for their children. This is mainly due to the fact that children are only able to get dependent visas via their investor parent if they’re 21 or under at the time their application is approved. Just last year, a staggering 90 per cent of EB-5 investor visas were issued to Chinese nationals – a huge leap from the 13 per cent back in 2004, according to government data. That’s a total of 8,308 visas. For wealthy Chinese investors, a green card is a highly desirable method of moving from China, with benefits such as better education options and an escape from the over-populated and heavily polluted country. Some may also wish to escape the broad anti-corruption campaign launched by President Xi Jinping. However, many are very grateful to immigrant investors, who provide an alternative and important source of financing to the United States – something that is particularly welcomed after the recent financial crisis. Investor programs have injected billions of dollars into major real estate projects creating new jobs for US citizens. Ready to Apply for an EB-5 Immigrant Investor Visa? When it comes to investing your money and your time, you want to focus on the business itself, instead of the business of immigrating. This is where we can help, as we specialize in helping individuals reach their goals by applying our expertise to each immigration case. We have helped hundred of investors to successfully get U.S. permanent residence through E-B5 applications, and we can help you too! The first step towards a successful E-B5 application is getting an assessment of your case. Fill out our free immigration assessment form and we will get back to you within 24 hours to discuss your eligibility and options.